Do you have a strong desire to go fast? A veritable need for speed, perhaps? Reviewers worldwide have raced madly through a Fairhaven mainly devoid of normality, but chock-full of cars, cops, and crashes. Even the single-player in Need for Speed: Most Wanted is an asynchronous multiplayer and the rules of both is "go fast" and "now go faster." Racing reviewers in the main enjoyed most of what they found. 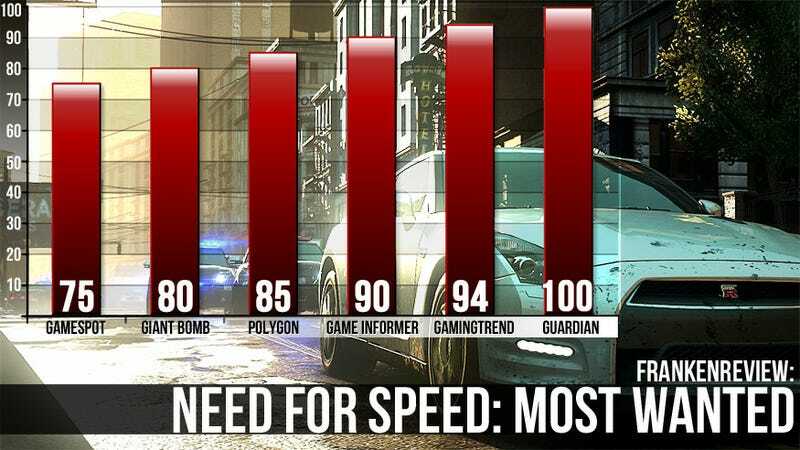 Read on to see if this Need For Speed really is the Most Wanted. If you get more air when crashing through a billboard than any of your friends have gotten, you can take pride in seeing your own gamerpic or avatar gracing the sign. However, if one of your friends has soared farther than you when destroying that billboard, it will be him or her you see displayed, and few things are more motivating than the prospect of smashing your friends' faces and their records, and claiming those little pieces of Fairhaven as your own. If you crave more competition, you can always easily access Autolog recommendations, which keep you apprised of events that friends have bested you at, or that you haven't tried yet, so opportunities for friendly competition are never in short supply. Even the racing has a wicked, filthy edge to it. Between events, you're asked to drive to the next meet up spot so that all players are in the same basic location when the next event starts. When that event is a race, it doesn't line you all up into some sort of formal starting grid. As soon as the GPS line appears on your map and you know which direction you're supposed to take, you're free to start moving in the basic direction of the first checkpoint, timer be damned. Even the drive to the meet up point has a bit of competition to it, as the player that gets there first gets a little bit of XP. At the end of the five-event group, the scores are tallied, a winner is declared, and you're ready for the next set. It's dumbfounding that all of Need for Speed Most Wanted's ailments are remedied in its excellent multiplayer mode. Cars can be switched on the spot, no warping required. Vehicles start with the nitrous boost unlocked and, barring very minimal restrictions, nearly every car can compete in every event. Multiplayer party hosts can even create event playlists, which allow them to choose from dozens of events, activities and races from an overworld map. That multiplayer is superior to single-player isn't really a surprise. It's a trite saying for first-person shooters that I'll extend to Criterion racing games: single-player is just training for the multiplayer experience. Cars are simultaneously coveted and disposable. It's great to find them in the world and pride yourself on beating/earning the high-prestige cars on the Most Wanted list, and yet tearing them up in high-speed wrecks and launching them off jumps (safe landing or not) brought a smile to my face. This dichotomy can lead to doubt, since you're free to upgrade and use any car in the Most Wanted races, and not all upgrades are clearly advantageous in all situations. Sometimes it's better to have higher top speed than acceleration, so you want to make sure you have the right car to compete. The ubiquity of cars also cuts down on their eminence and your drive to upgrade all of them. Criterion's freshly-rebuilt Chameleon engine brings the world of Fairhaven to life. The day and night cycle with high dynamic range lighting, the beautiful vistas of the open world (which is 3x as large as Paradise), the dingy industrial area, and the high-rise buildings are all rendered with stunning detail. The vehicles have been carefully reproduced with every line and curve meticulously recreated. Every paintjob is shiny and beautiful (for about 30 seconds until I put it into a guardrail anyway, and frequent gas stations will change your paint and make you pretty again), sunsets burn the sky with orange, yellow, and red, while rain clouds darken the sky with the threat of rain. I saw a side-by-side comparison between the Xbox 360 and PC version of the game, and I have to say that there isn't as much difference as you might expect. That isn't to say the PC version isn't gorgeous, it's more saying how fantastic the 360 version looks. Criterion has done it again, setting a new standard for arcade-style racing games which won't be surpassed until the next generation of consoles has been on sale for a while. It actually leaves one feeling a bit sorry for Forza Horizon, which is a very good game, and infinitely superior to its predecessors. But Need For Speed: Most Wanted is, by whatever criteria you may see fit to apply, a great game.